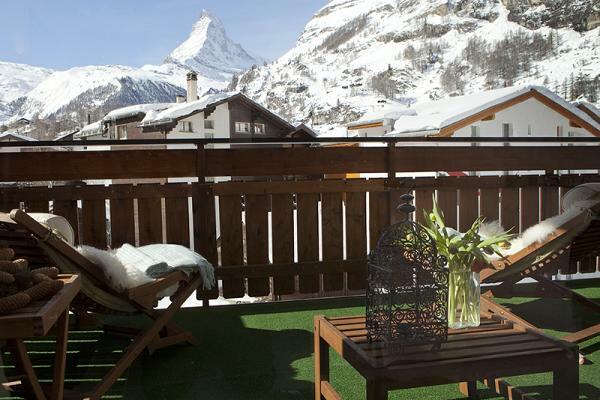 Chez Nous is a lovely, spacious, split level apartment in a modern south facing building (completed in December 2008) that has gorgeous views of the Matterhorn and is only a 5 minute walk from the centre of the village. For the last 2 years the apartment has been used as a private home and is available to let for the first time this winter. 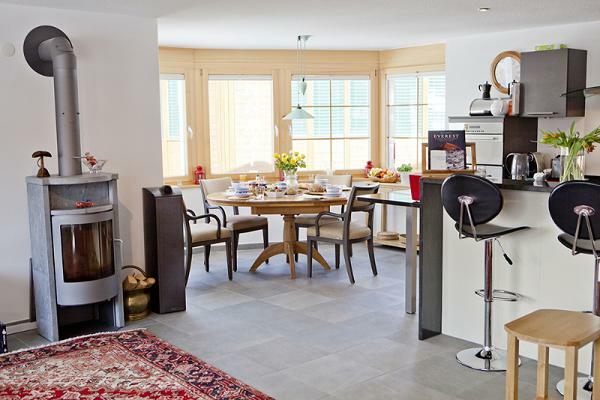 Chez nous has been decorated with style and attention to detail to create an apartment that is both comfortable and makes you feel at home the moment you walk in. 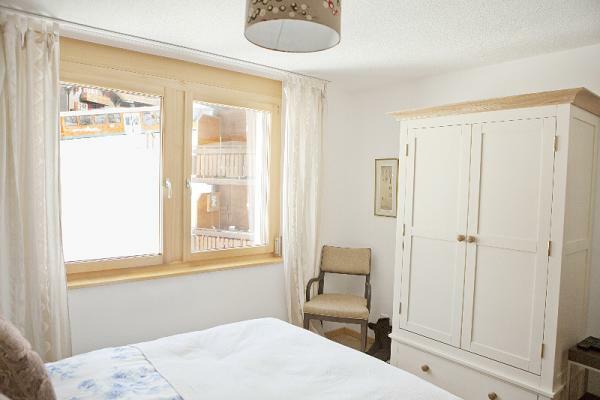 The apartment comprises three double bedrooms (one of which can be configured as a twin): the master bedroom has a large south facing balcony and ensuite bathroom with double bath/separate massage shower/WC. The other 2 bedrooms share a shower room/WC; one double/twin has an east facing balcony and the third room faces north with views of the Tasch and the Dom. All bedrooms are equipped with hairdryers, towels, dressing gowns and slippers as well as Sony radio/ipod docks. 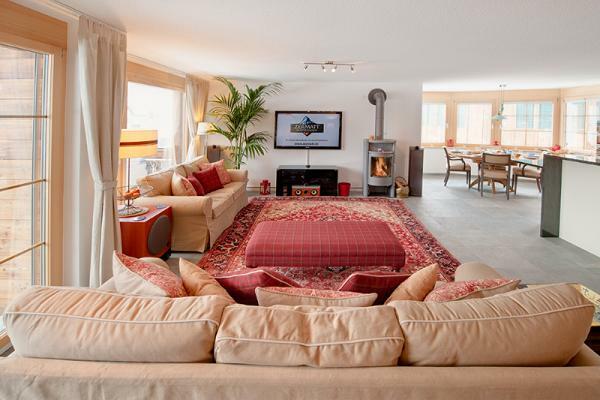 The large open plan living/dining/kitchen area is fully equipped with dishwasher, oven, microwave etc as well as a wood-burning fire and leads on to a large balcony with stunning 180 degree views. There is a 55" home-cinema system in the living room with UK channels, blu-ray/CD player/Ipod dock and free wifi. 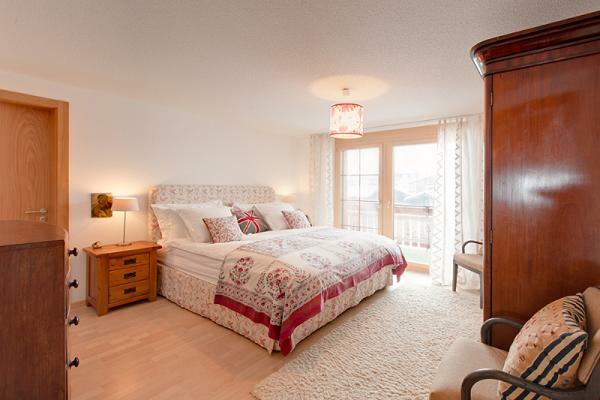 The apartment building has a lift, laundry room and ski room all for communal use. Please contact us about a reservation request for Chez Nous — we're happy to answer any questions you might have.